A “no tool” solution to custom display shapes! Pole Panel Art Hanging systems are a modular, re-configurable design that offers numerous options for art display panels and stands, making it perfect for museum galleries and trade shows, as well as building lobbies, retail environments, special events and galleries. Choose from a wide selection of available kits below, or design your own custom art hanging systems today! Click to see a gallery of Art Display Panels. No Tool Assembly for fast, easy setup. Accessorize with custom lighting, shelving and more. Sturdy, Roto Molded Shipping Cases and Tubs. 10ft Inline Art Hanging Systems. 10ft Inline Pole Panel Art Display with Slatwall & Podium. 10ft Inline Pole Panel Display with Slatwall, Shelves and Backlit Header. 10ft Bay Unit Art Panel Display. 10ft Inline Pole Panel Art Hanging System. Slatwall & Desk. 20ft Inline Bay Unit Display with Backlit Header. 20ft Inline Recessed Bay Unit Display with Backlit Header. 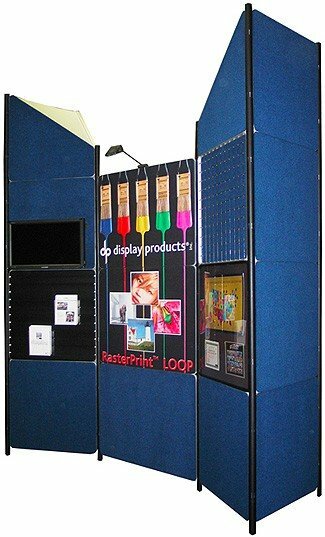 20ft Inline Bay Unit Display with Dye Sublimation Graphic. 20ft Inline Display with Podium. 20ft Inline Display with Podiums and Backlit Header. 20ft Inline Gridwall Display with Workstation and Backlit Header. 20ft Inline Bay Display with Workstations and Backlit Header. 20ft Inline Slatwall Bay Unit Display. 20ft Inline Art Panel Display with Backlit Headers. 30ft Inline Display with Backlit Panels. 20ft x 30ft Island Display with Conference Room and Podiums. All of the following are stocked colors, ready for shipping. Please realize that the following samples are limited in their ability to accurately depict colors. Every computer display is calibrated differently and therefore colors can vary from computer to computer. These swatches should however give you a relative idea of our color selection. PMS numbers given are the closest match available and are not exact.